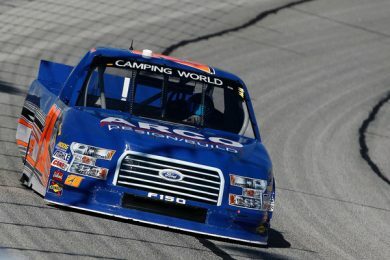 Austin Hill is ready to make his second NASCAR Camping World Truck Series (NCWTS) start of the season at Dover International Speedway piloting the No. 20 A&D Welding Ford F-150. With two wins in only four starts at the track, the NASCAR Next alum considers the 1-mile concrete oval his favorite track on the circuit. Hill led more than 60 laps en route to each of his victories in 2013 and 2014 at Dover International Speedway. His 2015 starts at Dover showed strong runs but a blown engine in his K&N car and pit road woes in his NCWTS debut at the track derailed those efforts. Hill has set high goals for himself and the team going into Dover, especially considering his previous success at the track. Finishing well at Dover carries extra weight for Hill and his team, especially since his opportunities to win are limited this year.